The much-anticipated day is here! 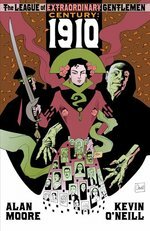 In stores everywhere TODAY are two brilliant new graphic novels, the final chapter of The League of Extraordinary Gentlemen: Century trilogy by Alan Moore & Kevin O'Neill, and The Lovely Horrible Stuff by Eddie Campbell. On top of that, three more major summer releases have rolled off the printing press and will be in a store near you very soon. And finally, the new Diamond catalog opens pre-orders on the newest member of the Top Shelf Kids Club -- Upside Down: A Vampire Tale! Grab these two gems today! The cataclysmic conclusion of the best-selling saga of everyone's favorite British band of metafictional marauders, the League of Extraordinary Gentlemen! In this chapter, the tattered remnants of the League face a fully-grown Moonchild amid middle eastern wars, nuclear anti-Muslim terrorists, and more. 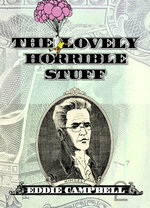 -- an 80-page full-color softcover, $9.95 (US). Award-winning graphic novelist Eddie Campbell (From Hell, Alec) presents a delightful autobiographical voyage into the financial wilderness. With his trademark blend of research, anecdote, autobiography, and fantasy, Campbell explores how money underwrites human relationships -- from the imaginary wealth of Ponzi schemes and television pilots, to the stone currency of the Micronesian island of Yap. -- a 96-page full-color hardcover, $14.95 (US). Hot off the press and heading to your store! 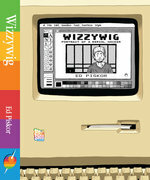 Inspired by the incredible stories of real-life computer hackers, Wizzywig is the thrilling tale of a master manipulator, Kevin "Boingthump" Phenicle -- his journey from precocious child scammer to federally-wanted fugitive, and beyond. In a world transformed by social networks, data leaks, and digital uprisings, Ed Piskor's debut graphic novel reminds us how much power can rest in the hands of an audacious kid with a keyboard. 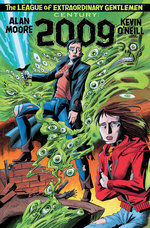 Named "the next big thing in graphic novels" by Rolling Stone magazine! -- a 288-page deluxe hardcover, $19.95 (US). From the award-winning writer/artist of Essex County and Sweet Tooth! As a deep-sea welder on a Canadian oilrig and a soon-to-be father, Jack Joseph's life is full of pressure... But he's about to discover something deep on the ocean floor that will change the course of his life forever. 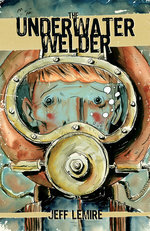 Equal parts blue-collar character study and mind-bending mystery, The Underwater Welder is a graphic novel about fathers and sons, birth and death, memory and reality, and the treasures we all bury deep below the surface. -- a 224-page deluxe softcover with French flaps, $19.95 (US). 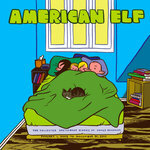 It's the long-awaited return of James Kochalka's massively influential and deceptively ambitious autobiography, American Elf! Every day of his life is captured in a single comic strip, sometimes profound and sometimes silly, but always full of the earnest Kochalka passion that led Hi-Fructose to call him "an unrelenting force, sure to solve the oncoming energy crisis," and earned him the title of Cartoonist Laureate of Vermont. This volume collects four years, from 2008-2011. -- a 384-page softcover, $24.95 (US). Pre-order now in the current Diamond PREVIEWS catalog: Upside Down by Jess Smart Smiley, and the new printing of Pat Grant's hit Blue! Finally, we're very happy to welcome a new face to the Top Shelf family, and to the Top Shelf Kids Club: the charming and talented Jess Smart Smiley! 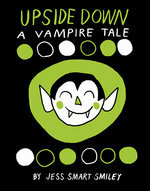 His new book Upside Down: A Vampire Tale has been introduced in our Kids Club sampler at Free Comic Book Day, and now it's coming to your store, in time for Halloween this fall! --deluxe 2-color softcover with french flaps, 6" x 9"
Also solicited: a new printing of the surprise Australian hit Blue, by Pat Grant! --deluxe 2-color softcover, 9.4" x 6.6"
A fascinating blend of autobiography and fiction with a sci-fi twist: in a seaside Australian town struggling with alien tentacle-creature immigration, a trio of aimless teenagers skip school to go surfing, chase rumors of a dead body, and avoid dealing with their own fears.